The chorus of former students who say they were sexually abused or harassed at a prestigious San Jose Catholic school for girls grew louder Monday. They accuse school administrators of violating California mandated reporter laws by not alerting police or Child Protective Services when the school was made aware of multiple sexual misconduct allegations going back decades. School administrators released a statement Tuesday saying they’ve handled all reports of sexual harassment in the appropriate manner, but an ongoing NBC Bay Area investigation has found that in multiple instances, school staff failed to report allegations of sexual assault or harassment to police, in possible violation of state law. At a news conference held by attorney Robert Allard, his team said they’re investigating accusations against eight teachers involving at least 17 victims. The mother of a recent Presentation High School graduate said her daughter was one of those victims. Dina Leonis said her daughter was sexually assaulted by a teacher while she was a student in 2013-14. The teacher, Leonis said, sent daily text messages and photos to her daughter, many of which were sexual in nature. Leonis said multiple students reported witnessing the inappropriate conduct by that teacher to school administrators, but police were never notified. “This failure led to multiple sexual assaults upon my daughter, causing her to suffer extreme emotional damage,” Leonis said. Leonis said she’s sharing her daughter’s story in hopes of preventing future students from being victimized. “I am here for future children, so horrible things don’t happen to anybody else,” Leonis said. Leonis was joined by former student Katherine Magana, who graduated from Presentation in 2010 and says she was sexually harassed by one of her teachers. “He’d relocate me to sit in the back of the class, and he would press his leg up against mine and rest his hand on my hand,” Magana said. She said the teacher regularly made inappropriate comments about her appearance. Magana said she was let down by school officials when she reported the harassing behavior. Magana’s accusations were supported by the account of another former student. 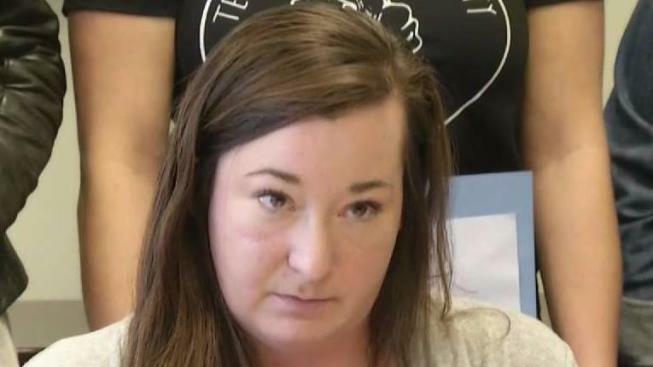 Shelby Rusconi did not attend Tuesday's news conference in person, but she wrote a letter accusing that same teacher of making sexually suggestive comments and inappropriate physical contact. But NBC Bay Area’s Investigative Unit has confirmed that multiple accusations of sexual assault dating back to the early 1990s against a former Spanish teacher were not reported to police by former Principal Marian Stuckey and current Principal Miller. The investigation also found that several allegations against multiple teachers since then, including at least one involving a current teacher, were also not reported to police when brought to the school’s attention. Allard called on Miller to step down or be removed from her role as principal. Miller is scheduled to transition into her new role as president of Presentation High School next year, the first in the school’s history. In a letter sent to alumni last week, the school’s Board of Directors reiterated its “unwavering” support for the embattled principal. NBC Bay Area will continue to update the story as we learn more.